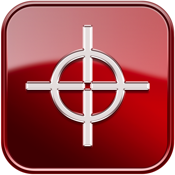 Measure distances from your iPhone to any choosen Target as far as you can see. No limits! It has the ability to get Target's position on map with a lot of other informations like coordinates, altitude, bearing, elevation angle, distance from user, etc. - Choose and Lock the target with flashing lines. - Select Face or Side and the estimate of distance will appear on your screen. - Press "Target Position" button and discover more information about your target like coordinates, altitude, bearing, elevation angle, etc. Warning: The flashing lines, must fit on both sides of target. If the flashing lines overlap or not fit well on target, you will not have the correct distance. - Gyro-Compass and Gyro-Elevation angle. - Up to 8X zoom. - Up to 73 different targets. - Color change for better visibility.